Reverse reads: "District #5, 902 Municipal Bldg. Akron, Ohio. November 19, 1937. Public Square, Canton, Ohio, looking north on Market Ave. County courthouse does not show but is on the immediate left. 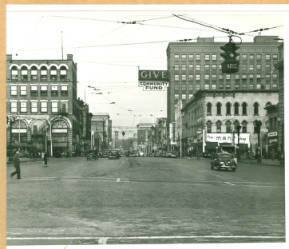 Stark Co." This photograph depicts downtown Canton, Ohio looking north from Market Avenue in the Public Square. There is a Gray's Drug Store on the left hand side of the street and a Lowe's and "Man's Store" on the right. Many trolly lines are visible above the streets and cars make their way through downtown. Canton is also home to the Pro Football Hall of Fame, the McKinley National Memorial, the William McKinley Presidential Library and Museum, and the First Ladies National Historic Site.